A 14 yo male under psychiatric treatment for cognitive decline, speech and gait disturbance since 2years. Report of previous CT study of brain normal. Films not available. MRI study of Brain shows bilateral symmetrical involvement of Globus pallidi. Focal hyper intensity surrounded by low signal intensity on T2 and T2*GRE images. 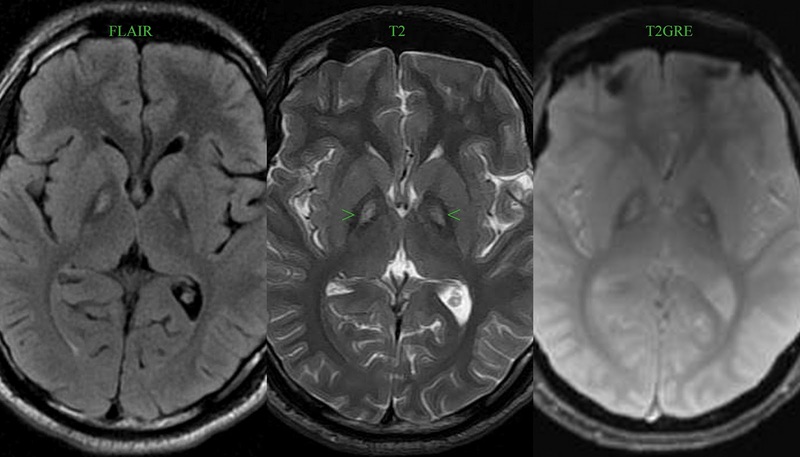 Imaging wise Diagnosis: Hallervorden Spatz Syndrome. (NBIA) is a new umbrella term for disorders of focal brain iron accumulation, includes former HSS, aceruloplasminemia, neuroferritinopathy and others. HSS is a progressive neurodegenerative disorder characterized brain iron accumulation. Imaging wise the diagnostic clue is "Eye-of-the-tiger" sign is a bilateral, symmetric foci T2 hyperintensity in globus pallidus surrounded by hypointensity. The ferritine bound iron deposition is responsible for T2 hypo intensity. CT Findings: Normal or Hyperdense Globus Pallidi. • T2WI and FLAIR : Eye-of the tiger appearance in Globus pallidi. • MRS: reduced NAA in GP implies to neuronal loss. Lab findings: Normal serum and CSF iron levels. o PKAN: PANK2 mutation on chromosome 20p12.3-p13. Theory is PANK2 mutation > CoA deficiency > energy and lipid dyshomeostasis > production oxygen free radicals > phospholipid membrane destruction. Basal ganglia in that GB is esp more prone to oxidative damage because of high metabolic demands. Cysteine accumulation in GP secondary to decreased phosphopantothenate causes iron chelation and peroxidative cell membrane damage is a contributing factor. Dystonia (most common), other extrapyramidal signs/symptoms are dysarthria, rigidity, choreoathetosis. Cognitive decline is frequent, dementia. Teenager with speech, psychiatric disturbance is classical. Majority present before age of 6 yrs. Palliative treatment with Baclofen, trihexyphenidyl, stereotactic pallidotomy, Pantothenate (vit B5). Reference: Diagnostic Imaging Brain, Anne G. Osborn.